Beef jerky comes in many different flavors. If you love beef jerky and you are looking for a snack that is much healthier than fries or potato chips, this is it. You can make your own beef jerky by dehydrating meat at home in a food dehydrator. 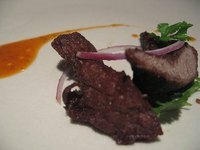 You also get to make your own marinade for the beef jerky so that you can be sure it is a flavor that you enjoy. Slice your flank steak into thin strips. Set aside. Finely chop your onion and garlic and put it in your mixing bowl. Place Worcestershire sauce, pepper, vinegar, liquid smoke and crushed red pepper flakes in the mixing bowl. Combine all of the ingredients. Place your flank steak slices in the mixing bowl and toss until evenly coated with the marinade. Cover the mixing bowl with plastic wrap and place in the refrigerator for 12 hours. It is best if you do this overnight. Take the flank steak slices out of the marinade and wipe them down with paper towels to dry them off. Place the steak slices in the food dehydrator and turn it on to low intensity. Let it dehydrate over the next six hours and then remove. Place the dehydrated beef jerky in to an airtight container and store in a cool, dark place. Make sure you remove any fat from the steak before you cut it into thin strips. Slice your beef against the grain so that it will be easier to chew. Some food dehydrators require you to spray the racks with nonstick cooking spray first. Read your directions so that your meat doesn't end up sticking to the rack.